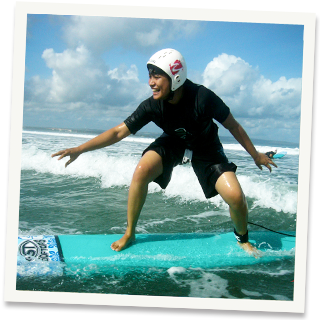 Bali Surfing Rip Curl School of Surf is located in "Double Six" on Legian Beach. It is one of the most popular surf schools in Bali because it is the famous surf brand Rip Curl. Instructors are all professional. This school is recommended for smal children and beginners. Rip Curl School of Surf is located in "Double Six" on Legian Beach. Because it is the famous surf brand Rip Curl, it is really popular surf school in Bali. Instructors are all professional and well trained, so smal children and beginners are also good to learn there. Locate in fashionable Double Six Beach! You only bring your swinsuit, all rental OK! English lesson by well trained instructors! Famous surf brand "Rip Curl" surfing school! Lesson on Legian Beach in front of Double Six Beach! Calm resort atmosphere comparing to Kuta! Beach break point is good for beginners! Near from fashionable and hot shopping area, Seminyak! Sufing Experience in Rip Curl has 2 course, Private (1 instructor for 2 students) and Group (1 instructor for 5 students). Children age under 12 lesson is available. Please contact us for details. The length of lesson time is 2 hours for Group Lesson and 60 min. for Private Lesson. * Start time will be changed everyday depend on the tide condition. It was the first time for me to experience surf with my friend. I was nervous because it was the first time for me, however the instructor kindly trained us so it was fun for us to surf. The explanation was in English, many Westerners joined surfing. There`s restaurants near the surfing location, it was not difficult to eat.